What do I do for fun? Unfortunately, I’m not sure. I know it’s fun to be with my granddaughter, Phoebe, especially if she’s having fun. But am I having fun, or am I enjoying watching her have fun? It’s not the same thing. 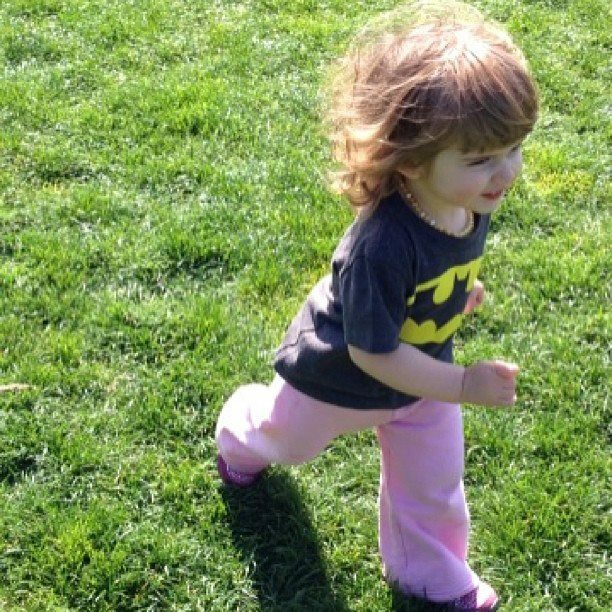 Phoebe, aka Bat Girl, at our local playground, having a blast. What did I do for fun as a kid? Read books. Do puzzles. Learn calligraphy. Shoot photos. Play in the woods. Collect things. Experiment in the kitchen. Use my imagination. Recently a friend of mine sent me a recipe for homemade coffee creamer. Shortly after that I came across a recipe for homemade iced coffee. Hmm. I do enjoy coffee occasionally. I really like it iced. I really like it with cream and vanilla. I chose to make both of these recipes. It required a bit of planning and a trip to 2 stores. Was it worth it? Yes. And it was fun. Intentional fun. I had fun planning the equipment needed to make the iced coffee. I had fun shopping for the ingredients. I had fun in the kitchen making something I had never made before. What else can I intentionally do for fun? p.s. Thanks to Ree Drummond of The Pioneer Woman for the Perfect Iced Coffee recipe and Carrie Vitt of Deliciously Organic for the Homemade Creamer recipes. I made the Honey Vanilla version. 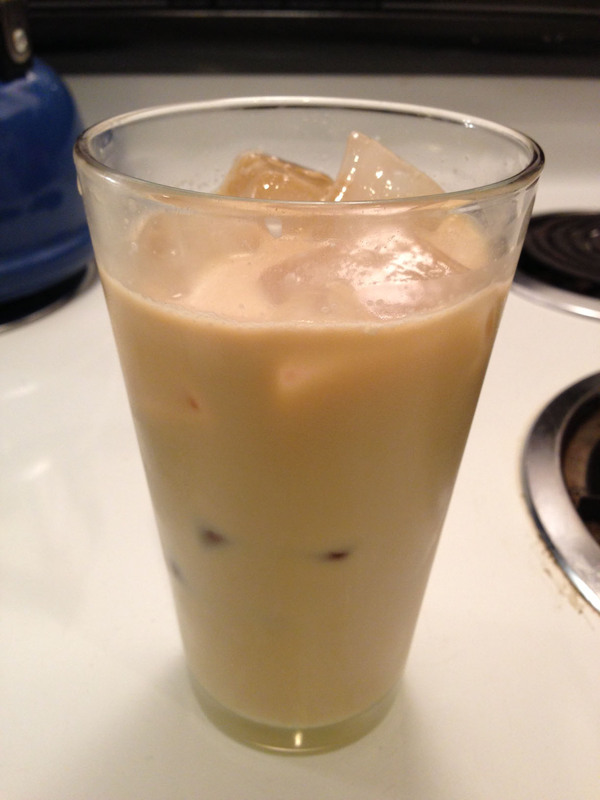 I also added a bit of organic sweetened condensed milk to my drink pictured here. Biscuits. So simple. You probably have the ingredients without an extra trip to the store. They go with any meal of the day. Winter-time soups and stews cry out for a biscuit buddy. You can jazz them up with a few additions, or keep them basic. Making these reminded me of when my son was a toddler and I made dinner every night. Our humble dinners of hamburger gravy over biscuits weren’t fancy, but they were made with love. 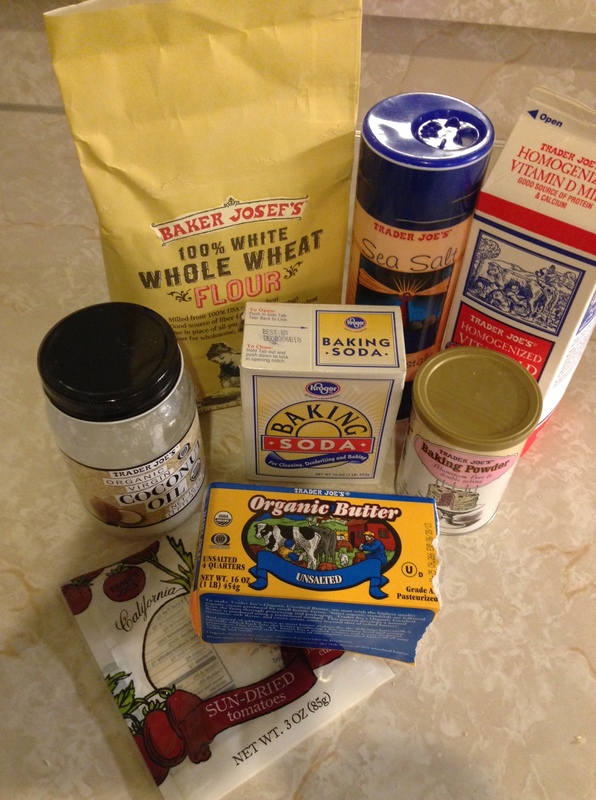 In a large mixing bowl, combine flour, baking powder, baking soda and salt. 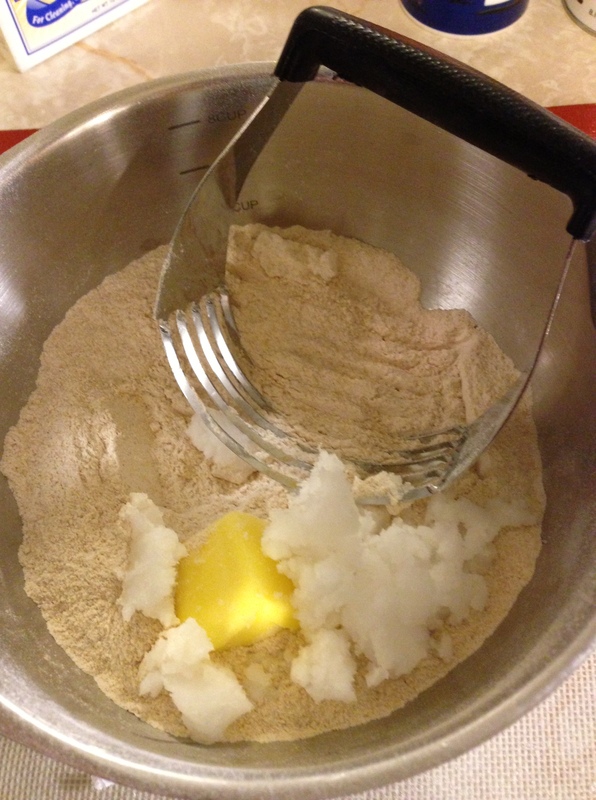 Using a pastry blender (as shown in photograph) or 2 butter knives, cut butter and coconut oil into dry ingredients until mixture looks like crumbs. Mix in the sundried tomatoes. “Cutting in” the fats into the dry ingredients with a pastry blender. Turn dough onto floured surface, dust top with flour and gently fold dough over on itself 5 or 6 times. 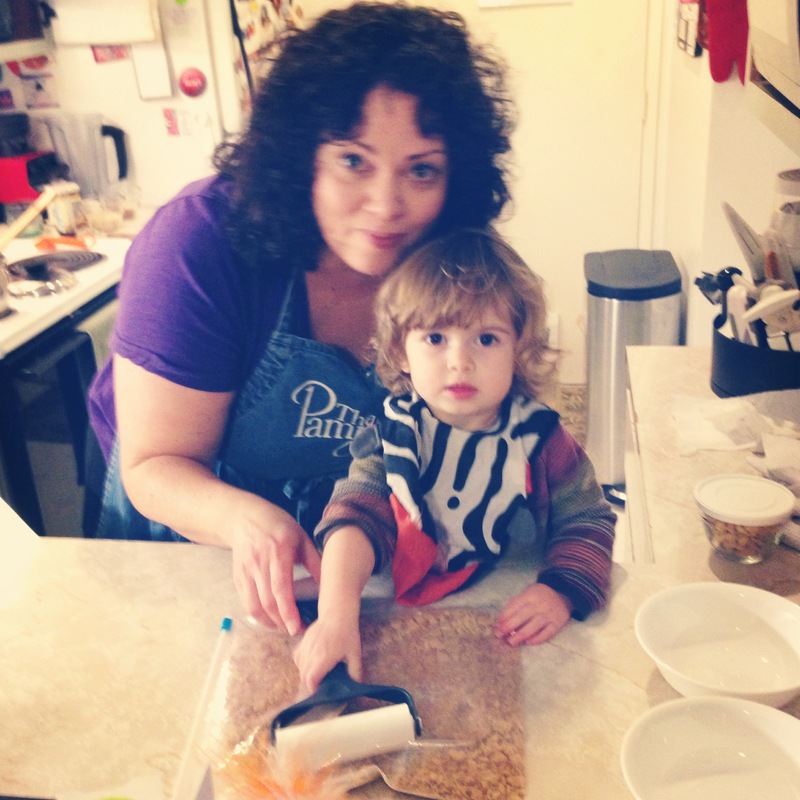 With the palms of your hands, press the dough into a 1-inch thick round. Cut out biscuits with a 2-inch cutter, being sure to push straight down through the dough. Experimenting with different sizes of biscuit cutters. Place biscuits on baking sheet (covered with parchment if you like) so that they just touch. Reform the scraps of dough, working it as little as possible and continue cutting out biscuits. If you have other sizes of cutters, go ahead and try them out. I made mini-biscuits with this batch. Bake until biscuits are light gold on top, about 15 minutes. During last 2 minutes of baking, prepare the garlic butter as follows. Melt the butter in a small saucepan or a microwave-safe bowl. Stir in the garlic powder, salt and parsley flakes. 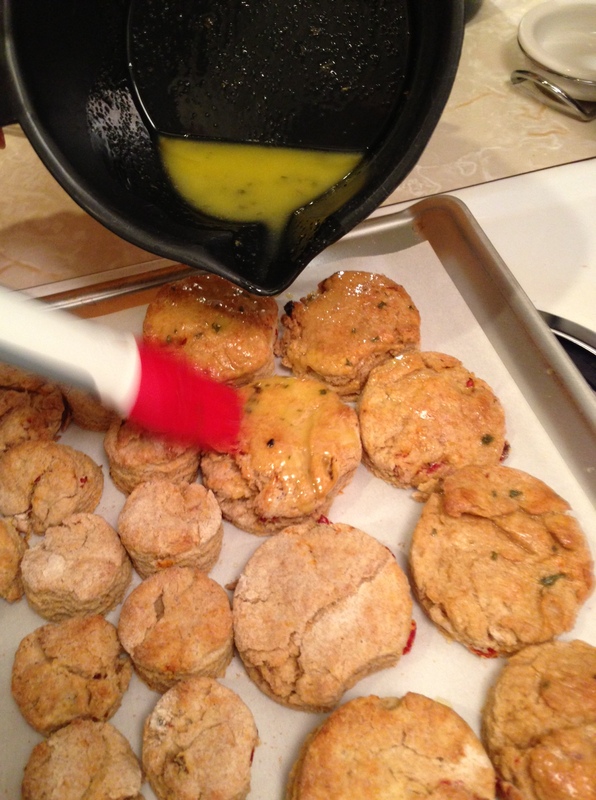 When the biscuits are out of the oven, immediately brush the tops with the garlic butter. * If you don’t have coconut oil, use another 2 tablespoons of butter. ** A substitute for buttermilk is 1 tablespoon of lemon juice in a 1-cup measure, then finish filling the 1-cup measure with milk. There’s about a thousand ways to make biscuits. If you have a favorite, I’d love to hear it. I came across this recipe when browsing through Food Network’s website during the height of the Christmas cookie baking season. 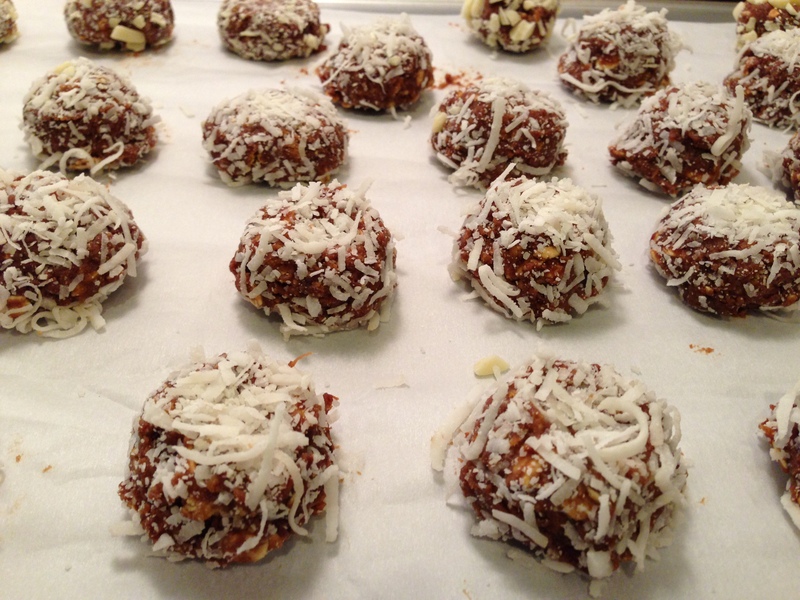 But this is a no-bake cookie made with alternative ingredients to make it less guilt-inducing. I had never made a cookie like this before and it seemed right up my alley so I bookmarked the recipe, bought the ingredients, and about 3 weeks later found the time to actually make them! It helped tremendously that my granddaughter, Phoebe, was on hand to assist. It was nice of the ingredients to wait patiently until I was ready. The results were so good that I promptly made a second batch to share. Combine the dates, water, and lemon juice in a medium saucepan. Simmer over medium heat, breaking up any large pieces of dates with a spoon, until the mixture resembles a thick paste, 15 to 20 minutes. Stir in the honey, peanut butter, cocoa powder, butter and salt until evenly combined. 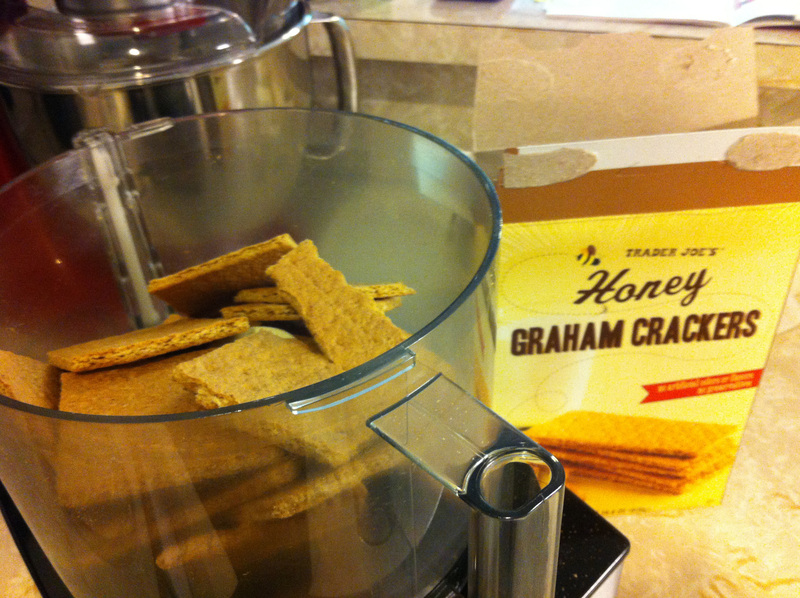 Stir in graham crackers and oats. Remove from heat. Line a baking sheet with parchment. Drop level tablespoons (or use a small scoop) of cookie mixture onto the prepared pan. Refrigerate until just chilled and set, about 20 minutes. Put desired toppings in small bowls. Roll each cookie in desired topping and flatten slightly into a plump disk. Serve chilled and store extras in refrigerator. Fun to make with kids. 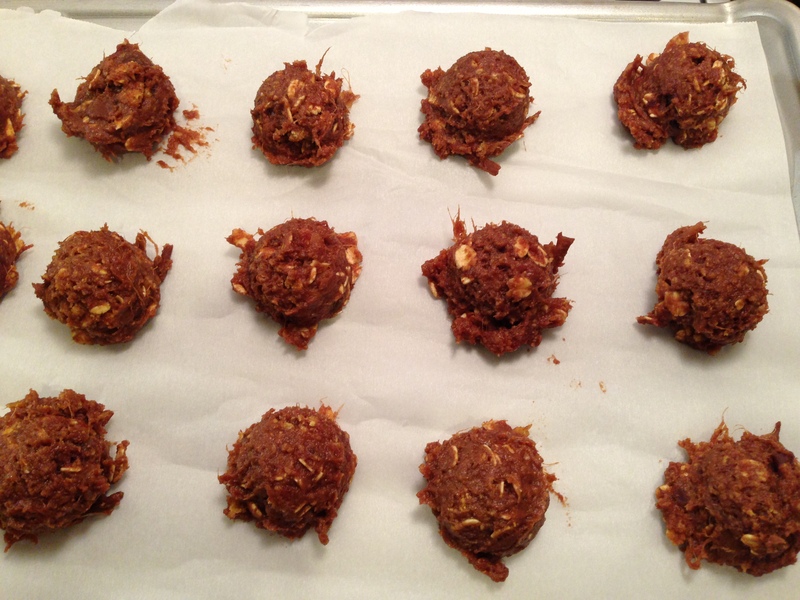 Healthy alternative to a “regular” cookie. The beginning of something great. Chocolate Candy Cane Muffins. Or so I thought. The title picture of these muffins looks fabulous. They didn’t taste fabulous because I missed the salt and baking soda in the ingredient list of the recipe. What a difference salt makes! Without it these were a bit flat tasting. Even the peppermint and chocolate just wasn’t enough to make up for the lack of flavor. Check out my second try. These had fabulous flavor but not exactly picture perfect. They stuck to the pan and broke apart as I removed them. I dressed them up with wide ribbon for gift-giving but this recipe needs to go back to the drawing board. I think sprinkling on the crushed peppermint candies just AFTER baking would be better. So I moved on to the snickerdoodle recipe. Snickerdoodle muffins! Yum! Who doesn’t love a snickerdoodle? These turned out amazing! This recipe is a keeper and great for gift giving. By the way, I LOVE my stoneware muffin pan (see it in the background) because it really helps the muffins turn out great by evenly distributing the heat, and it’s a bit deeper than the metal pans I have. The metal pans were probably part of the problem with the second batch of the Chocolate Candy Cane muffins. I got the recipe from Food Network Magazine and here it is if you want to try these yourself. Make the cinnamon crumble: Mix 2/3 cup sugar, 1/3 cup flour and 1 tablespoon cinnamon; mash in 1/2 stick softened unsalted butter. Make the batter: Mix 2 cups flour, 1 teaspoon baking powder, 1/2 teaspoon salt, 1/2 teaspoon cinnamon and 1/4 teaspoon baking soda. Whisk 3 eggs, 3/4 cup sugar, 1 stick melted unsalted butter, 1 cup sour cream (or plain Greek yogurt) and 1 teaspoon pure vanilla extract; fold into the flour mixture. Mix 1/2 cup of the cinnamon crumble into the batter. Divide among 12 muffin cups lined with paper or foil liners that have been coated with cooking spray. Top each with the remaining cinnamon crumble. Bake at 350 degrees for 25 to 28 minutes, until a wooden toothpick comes out clean. I made 4 different flavors of Christmas muffins for gift giving and it was so fun! The giving part was the MOST fun. If cheesecake is being served, then something special is happening. It’s celebratory and decadent. 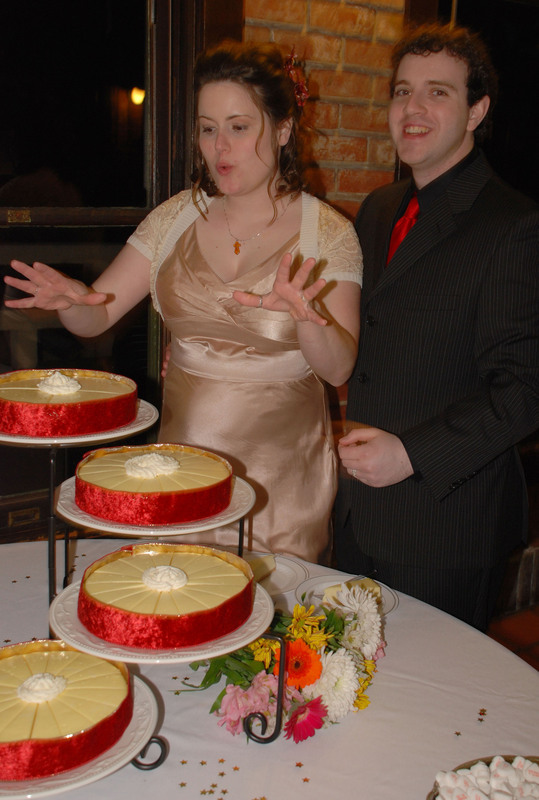 In 2007 I started a dessert business called Diva Sweets and I sold cheesecake to restaurants and catering companies. Then 2008 happened. So I put baking on hold for awhile and focused on my health and fitness. Now I know how to make great desserts and take good care of myself at the same time. Here are the beginnings of a great thing. Actually 2 things. The whipping cream and espresso powder on the right are for my Mocha Cheesecake that I made on the same day. I’ll save that for another blog post. 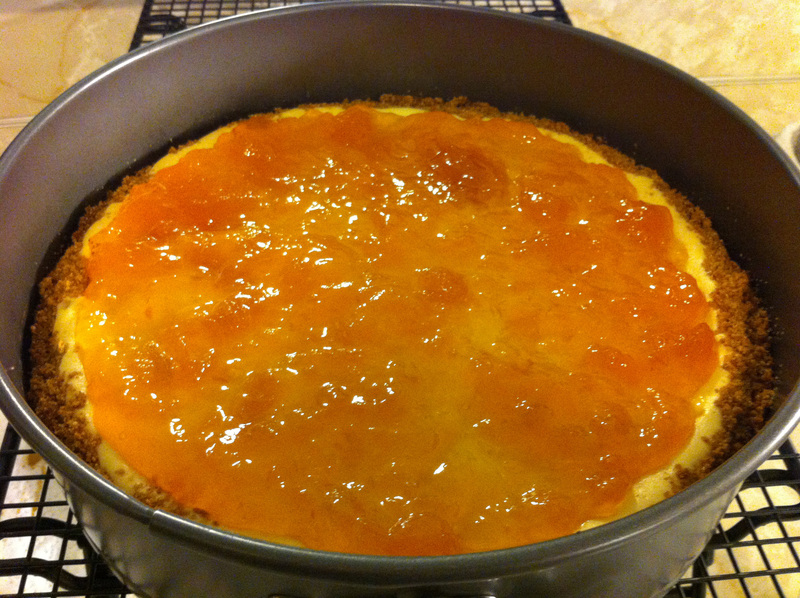 For now, the focus is on the Peach Cheesecake that came from a Paula Deen recipe which I adjusted a bit by decreasing the amount of sugar, and adding cinnamon to the crust. I think peaches and cinnamon go well together. 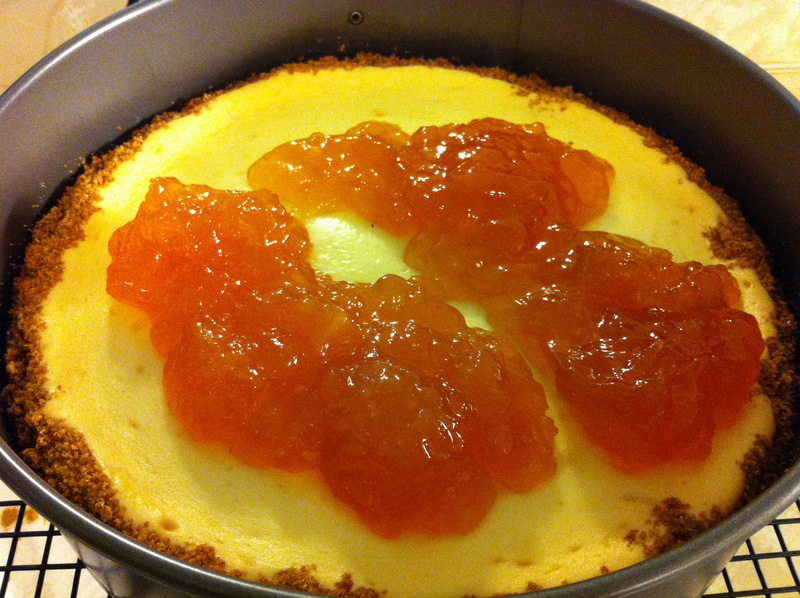 And I think that cheesecake crust is often boring. The same graham cracker style crust is used so often. I see the crust as an opportunity to add more to the flavor profile of the entire dessert. So that’s what I do. Take an existing recipe and jazz it up. There were no leftovers when I served this so it was a success! I hope you make a cheesecake at least once in your life. It’s simple. Time consuming, but simple. I have to remind myself not to start one too late in the evening or I’ll be up until midnight waiting for it to cool. I also put out all the ingredients the night before so they can truly be at room temperature. The eggs, cream cheese, jam, whipping cream, sour cream, and anything else. If Ina Garten (The Barefoot Contessa) does it, I can do it. I use my food processor to efficiently transform crackers into crumbs. 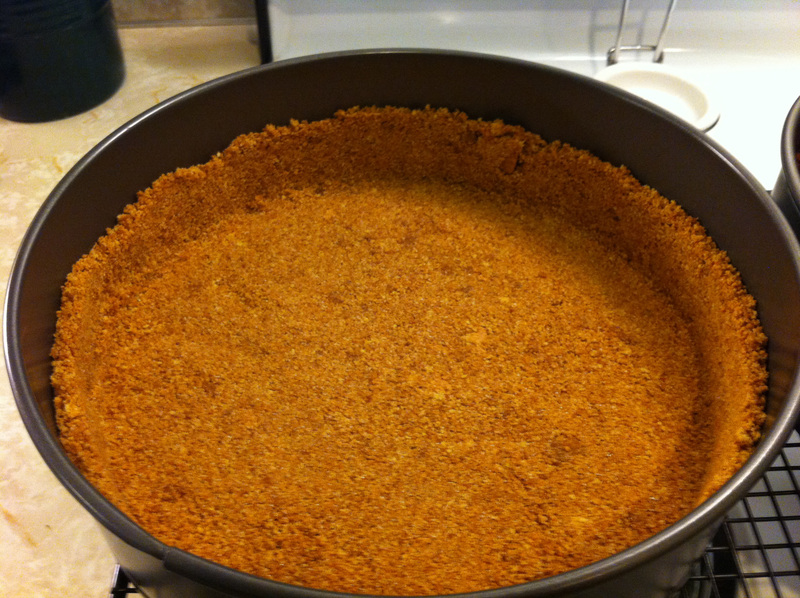 In a medium bowl, combine graham cracker crumbs with the sugar and butter. Mix well and pour into a 9-inch springform pan. 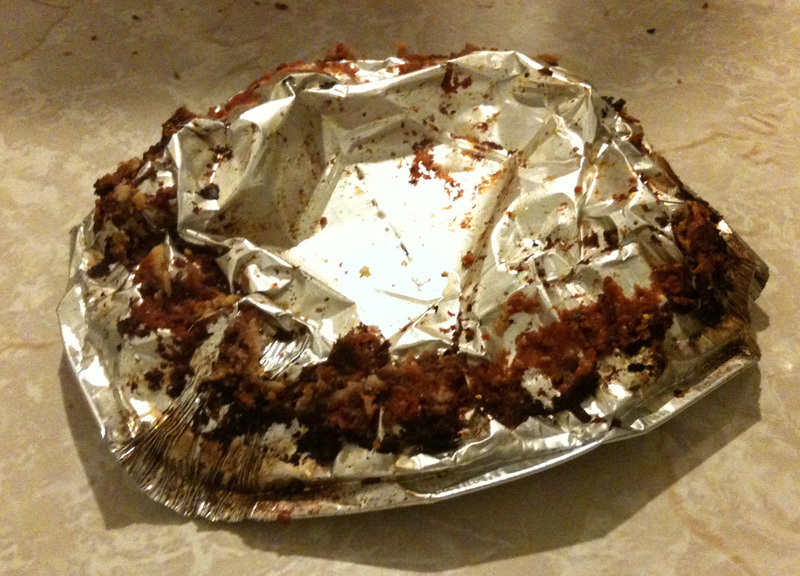 Using a flat bottomed glass, press the crumbs onto the bottom and 1-inch up the side of the pan. Bake for 10 minutes, then move to a wire cooling rack while preparing the filling. Here’s a tip to make removing the cheesecake from the pan much easier. Use parchment paper on the bottom of the pan. Stretch a piece of parchment across the pan bottom piece. Place the ring on top and clamp it on. Trim the excess paper from around the pan using kitchen scissors. When you’re ready to transfer the cake to a serving platter, just pull it off the pan bottom using the edges of the parchment. Prepare the filling by beating the eggs and cream cheese together until well combined. Add the sugar and vanilla and continue beating until well blended. Add ¼ cup peach jam and mix until incorporated. Pour mixture into prepared crust and bake until filling is set in center and edges are puffy, about 50 minutes. Remove from oven to a wire cooling rack and let cool for 10 minutes. Run a thin knife around the edge of the cake. …spreading jam just to the edges of the cake. Cool to room temperature and then refrigerate overnight, or longer, before slicing. Have you ever sliced a cheesecake? If you’d like to not massacre it, please use my instructions below. You’ll be thrilled with the results! What you’ll need: a long knife, a clean kitchen towel or folded paper towel, hot running water or a deep pitcher of hot water. Hold the knife under hot running water for 20 seconds. Wipe dry with towel. 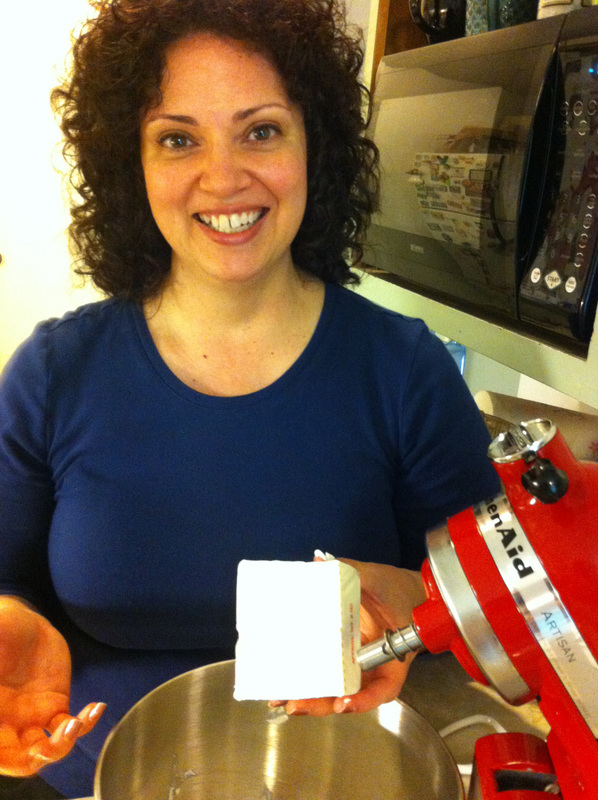 Slice cheesecake in half by pressing the knife into the cake, then pulling it through. Rinse the knife in hot running water, towel dry, and slice again. Repeat this process until you have the desired number of slices. Food as gifts, with an Italian twist. This month has given me opportunities to bless friends with a meal. One friend had back surgery and another set of friends had a baby. I was brainstorming with my husband about what to make and we decided on lasagna. I can make several at once so there would be some for us also ~ score! I made the lasagnas on Saturday, baked them on Sunday, then froze the ones I was giving away. That way they would be ready when I was ready to deliver the meals. To round out the meals, I bought dinner rolls from Great Harvest Bread and Caesar Salad mixes from Trader Joe’s. If I’d been really ambitious, I would’ve made my Rosemary Dinner Rolls! Oh well, next time. 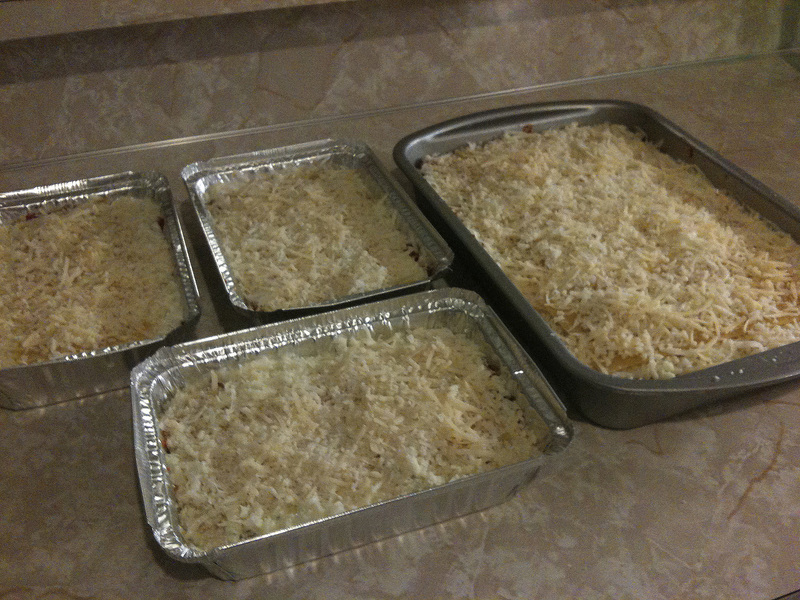 One thing I forgot to do was take pictures of the beautiful lasagnas after they were baked. I think I was too hungry to think about a photo op! I doubled the recipe and made one in a 13 x 9 pan as usual, then 3 smaller ones that fit perfectly into single-use pans I bought at the Dollar Tree store. The big one was for our fellowship group that meets on Sunday evenings. One of the small ones was for us, and the other two small ones were to give away. It all worked out fantastically and everyone was well fed! Coat a large saute pan with olive oil and bring to medium heat. 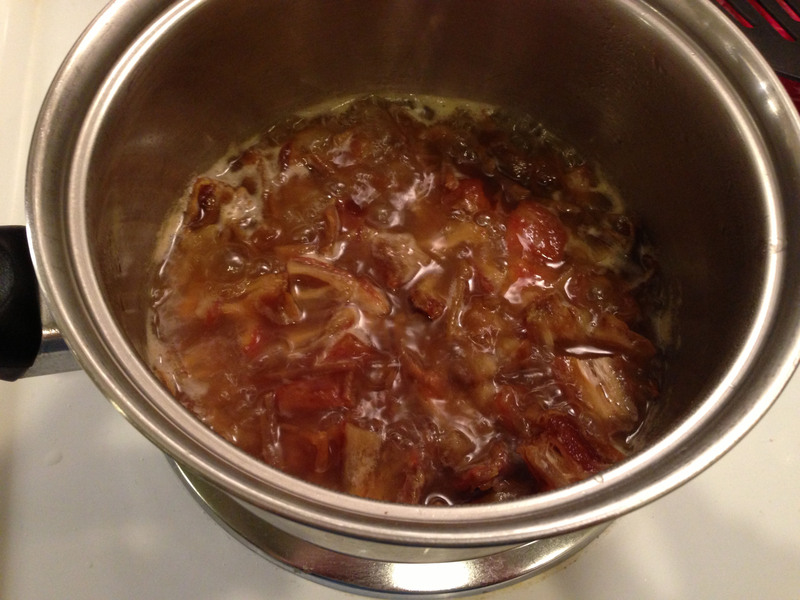 Add the onion and cook until it begins to soften, about 5 minutes. Add the garlic and cook for one minute. Add the sausage and cook, mixing it with the onion and garlic, until brown and crumbly. Turn the burner to low. Drain the fat from the pan. Then mix in the red pepper flakes, Italian seasoning, salt, pepper and tomatoes. Let the pan simmer on the stove while you get the rest of the ingredients ready. In a small bowl, combine the ricotta, cottage cheese, half the parmesan, the eggs and the basil. Mix to combine well and season with salt to taste. If you have a food processor, I highly recommend blending these ingredients together in it to thoroughly disguise the cottage cheese since some folks don’t like it. They’ll NEVER know! In the bottom of a 13 x 9 inch deep dish baking dish, add a couple ladlefuls of sauce and spread out in an even layer. Arrange a layer of the noodles to completely cover the sauce. Spread 1/3 of the ricotta mixture over the pasta. Spread 1/3 of the sauce on the pasta and sprinkle a layer of mozzarella and some of the remaining parmesan. Place another layer of pasta going in the other direction as the first layer (this will give a little more stability). Then repeat the layers of ricotta mixture, sauce, mozzarella and parmesan. Be sure the last layer is pasta covered with sauce, mozzarella and parmesan. The ricotta mixture is usually gone by the time you get to this layer. Cover with foil. 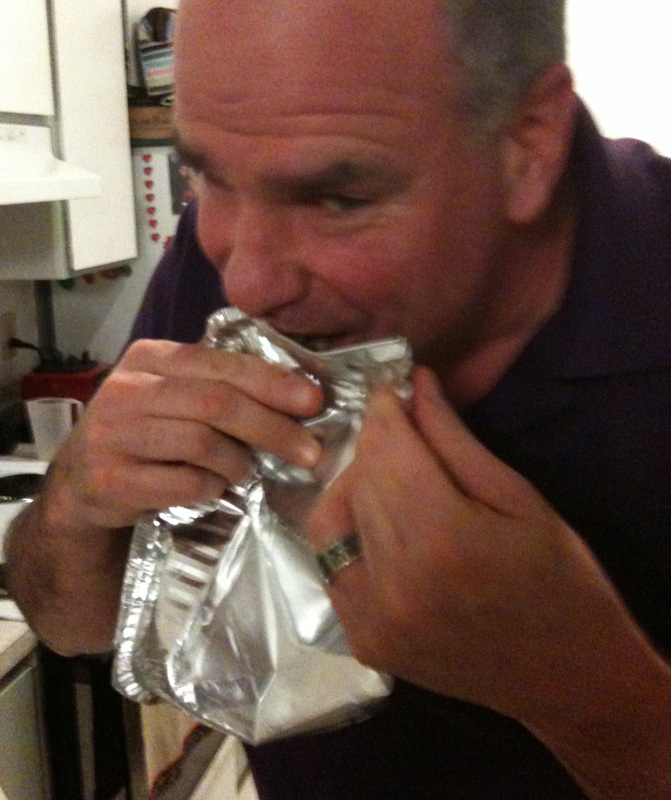 I recommend the foil with the non-stick side so you’re less likely to lose any cheese on top. Place the lasagna on a baking sheet and bake in the oven until the lasagna is hot and bubbly, about 1 hour and 15 minutes, removing the foil for the last 15 minutes of cooking. Let cool for 20 minutes before slicing. Note: for optimal slicing, make and bake the lasagna the day before. Heat it up again before slicing. Assembled and ready for the oven. Oats and Black Cherries ~ who knew? 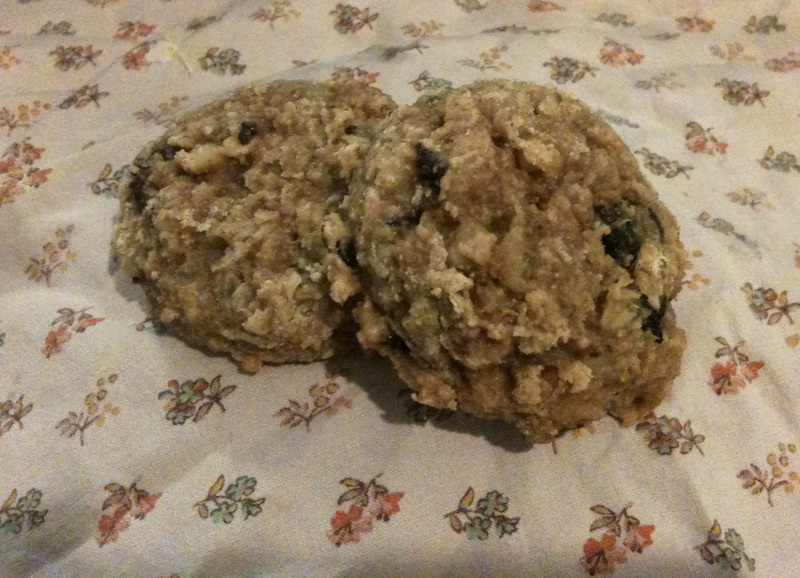 In an effort to make a healthier oatmeal cookies, I remembered an old recipe that used unsweetened applesauce as a substitution for some of the butter, eggs and sugar. I searched in all my recipe binders, card files, and nooks & crannies where I keep recipes but I could not find it. So I decided to experiment and figure it out for myself! I also wanted to jazz it up a bit. Raisins are usually found in an oatmeal cookie recipe but any dried fruit will do really. I thought of cherries. Cherries are good. I can get dried black cherries that are unsweetened and unsulfered at my local Trader Joe’s. Bingo! My box of old-fashioned oats has a basic recipe that “leaves lots of room for creativity”according to the caption under the recipe title. 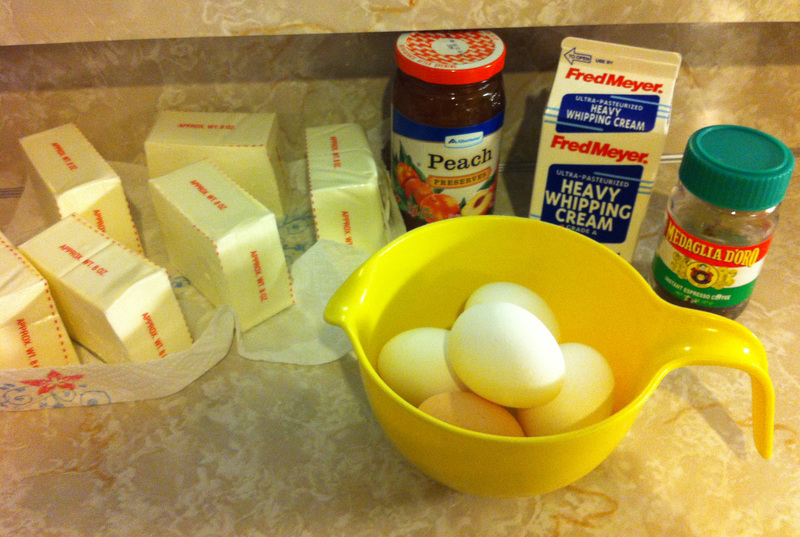 So off I went, cutting in half the butter, eggs and sugar; and adding 1 cup of unsweetened applesauce in its place. These cookies have a different texture than traditional ones, and the flavor is fabulous! Preheat oven to 350 degrees. In a large bowl with electric mixer, beat butter, brown sugar and vanilla until light and fluffy, about 1 minute. Add applesauce and egg; mix until thoroughly incorporated. Add oats, flour, baking powder, cinnamon, nutmeg and salt. Mix on low speed until blended. Add cherries and nuts; mix on medium speed just until combined. Drop by heaping spoonfuls (about 2 tablespoons’ worth) onto greased baking sheets (or use parchment or silicone baking mats) placing about 1-1/2 inches apart. 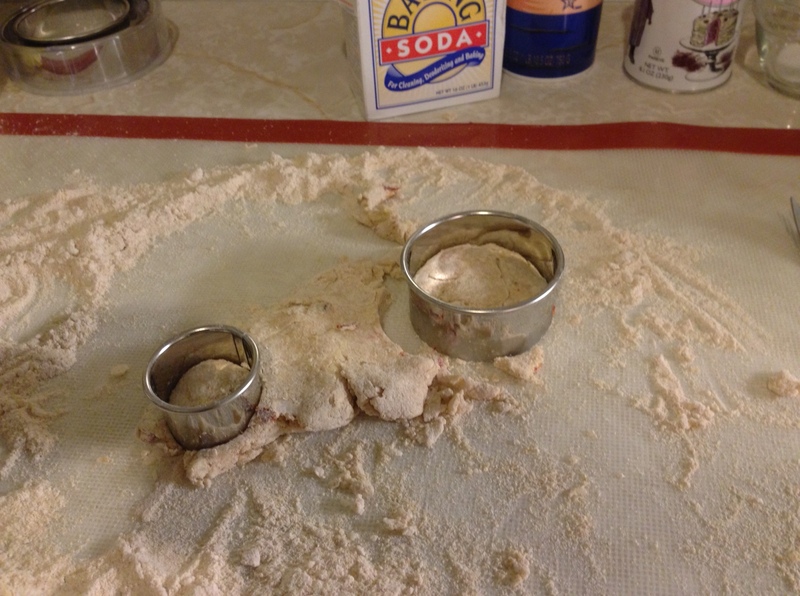 Flatten the cookies slightly using the bottom of a small glass dish or drinking glass dipped in flour. Makes about 36 cookies, depending on how heaping your spoons are!